Yesterday, seeing as it was such a nice day again with virtually no wind, and the promise of sunshine. I set out on another walk, starting at Cosmopolitan Park, then Rotary Park, along Saskatchewan Crescent and finally ending at Gabriel Dumont Park. Merlin - 1 perched atop a spruce on Broadway. Common Redpoll - a flock of around 15 birds on a lower trail of Cosmopolitan Park, feeding on seeds of some kind. 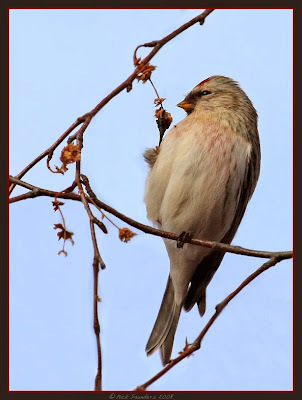 Hoary Redpoll - I managed to spot one among the group of Common Redpolls. White-throated Sparrow - This was a nice surprise. I found this late bird skulking alone in one of the dense shrub 'islands' in Rotary Park. Every so often it would give its drawn out "shiiip" sound. As I made my way across a lawn, I noticed the bird drop down onto the lower branches of a Mugo Pine Tree. As I got closer, it completely vanished, and I was unable to locate it again, after searching diligently for nearly 30 minutes. This looked like a female bird. Common Raven - 2 squawking as they flew north over the river. White-winged Crossbills - a flock of around 15 flying towards the west side of the river, heading for some evergreen trees. My last bird of the day was a male Northern Flicker sitting atop a spruce tree on 4th st.
Other species seen were , 3 Downy Woodpeckers , 4 Red-breasted Nuthatch , 10 Black-capped Chickadees , 5 House Sparrows and at least 200 Rock Pigeons under the Idylwyld Bridge jumping onto the floating icebergs every so often to get a drink. Here's the Hoary Redpoll I found in Cosmopolitan Park . Note the smaller bill , steeper forehead, light pink on breast and the white on the rump. This looks like it was a very nice journey with many species observed. The picture of the redpoll is very... You have them more and more in Iceland and they have been breeding quite well these last years!!! That is such a cute one! Birds are so amazing to photograph as their species exhibit so many beautiful features! That is a beautiful bird.If you can,please send one of those Varied Thrushes over to my place. Sweet photograph. Lucky you to see so many birds. A beautiful and very interesting shot. Is his left leg lifted up & caught on that branch? Or maybe an ilusion?